Hello, Altenew friends! 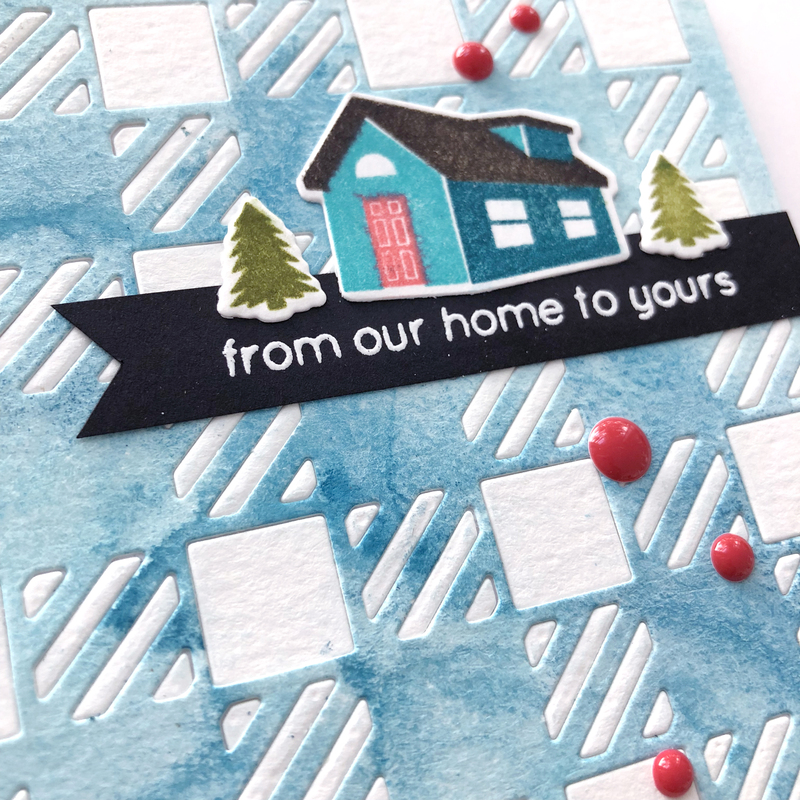 Norine here and I’m back with you today with a couple of cards I made using the recently released Cozy Flannel Cover Die. I spend the summers with my husband in Northern Canada and now that it’s September, cozy flannel sounds about right! 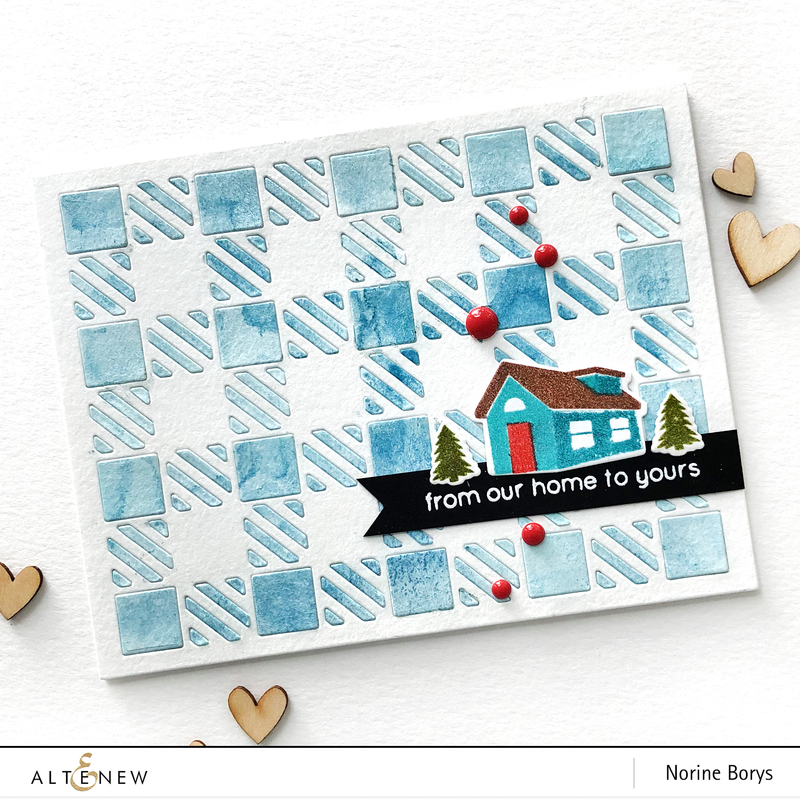 I also wanted to use the From Our Home Stamp and Die Set from the September 2018 Release, so the end result is a cozy and non-traditional pair of Christmas greeting cards. There is a video linked at the end of this post, so if my written instructions are unclear, watch that and it should all make sense. I began by painting an A2-sized panel of watercolor paper. I dried the paint with a heat tool so that I could “chase” the water and pigment and get more distinct patterns than you get with air-dried watercolor paint. When the paint was dry, I die cut the painted panel with the Cozy Flannel Cover Die. I also cut the 2nd panel of plain, unpainted watercolor paper with the same die. So now I had two Cozy Flannel Cover die-cuts. Now for the tricky part. I removed the die-cut panels from the die as carefully as possible, trying to keep all the bitty pieces in place. One or two fell out but they were easy enough to tuck back into place. I laid each of them face UP on my craft mat and covered the face of the die-cuts (with both negative and positive pieces together), with a sheet of Glad Press and Seal cut just larger than the card panel and pressed firmly to help it stick. Next, I cut a piece of printer paper in 4, giving me 4 panels of A2-sized paper. 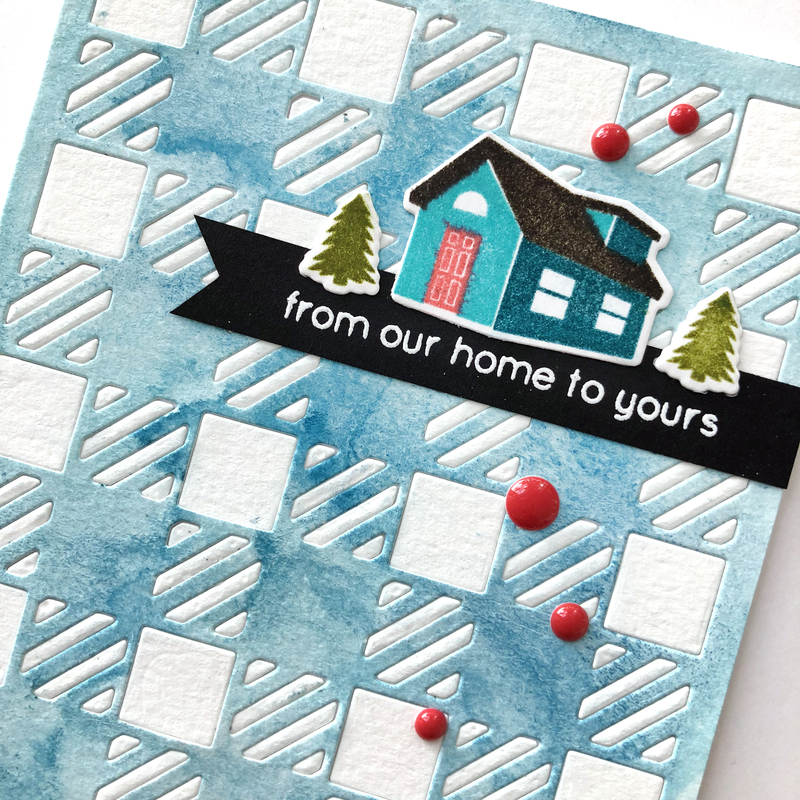 With the Press and Seal holding all the pieces of the die-cuts in place, I began laying tiny dots of liquid adhesive all over the “positive” portion of the die-cut – that is the outline plus the large strips of the plaid design. Once that entire piece was covered with adhesive, I covered the panel with one of the pieces of printer paper. Printer paper, being much lighter weight than cardstock, allows you to create a card with less bulk since it is a hidden layer. With the die-cut adhered to the printer paper, I could pull off the positive portion of the die-cut and leave behind all the “negative” pieces of the die-cut, still stuck to the Press and Seal. At this point, I repeated the step of laying down tiny dots of liquid adhesive, but this time all over the negative pieces – the squares and angled strips. Then I took the Press and Seal covered die-cut, flipped it over, and began pressing all the little blue painted pieces into their corresponding openings of the white POSITIVE portion of the die-cut and then I repeated the reverse with white negative pieces into the openings of the blue painted panel. With two card backgrounds created, I began to build the rest of the cards. 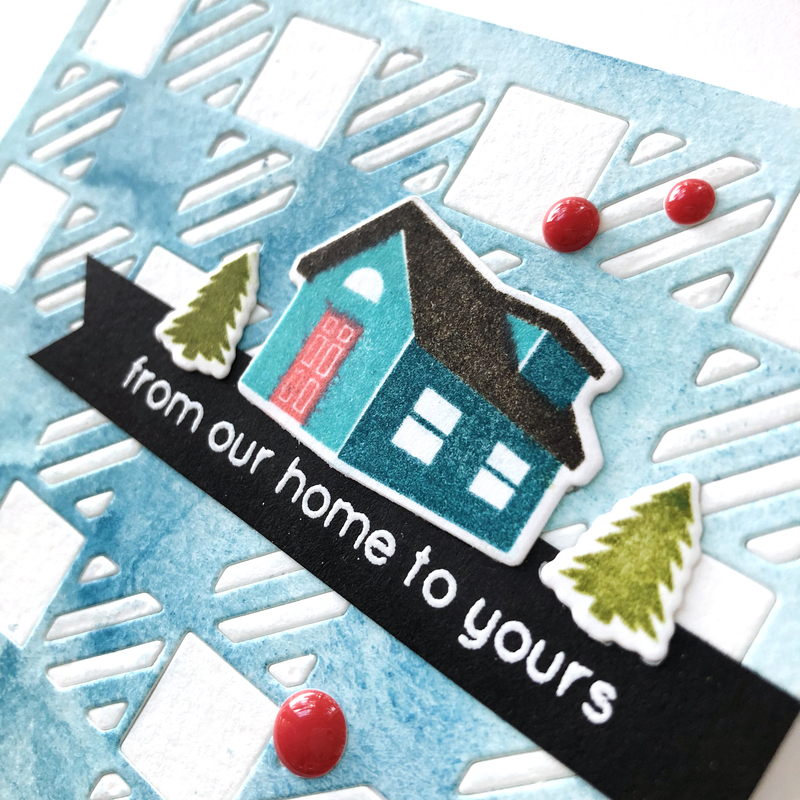 Using the stamps from the From Our Home Stamp Set, I stamped onto white cardstock with combinations of Volcano Lake, Lagoon, and Emerald inks. I chose Dark Chocolate or Black for the roofs and Heart Beat for the red front doors. Finally, I stamped several little trees with Moss Ink. Then I die cut the stamped images using the corresponding dies and arranged them on a black strip of cardstock that I had stamped with the sentiment from the From Our Home Stamp Set, and white heat-embossed. I finished off the cards with a few red enamel dots and adhered the card panels to their card bases. I love this inlaid die-cutting technique. Depending on the intricacy of the die, it can be fiddly work but it’s very straightforward and not difficult to do. You can watch the video tutorial below or in HD on Altenew’s YouTube channel. I hope you enjoy the video and are inspired to try the technique. It’s a guaranteed way to get 2 cards from one effort! And that’s never a bad thing, am I right? Thanks for stopping by and have a wonderful day! Your cards are amazing !!! Even with all the little tips you’re giving, it represent a lot of work and patience ! I love your choice of colors. Very pretty. The Stick and Peel really helps with techniques like this.